And after the timelines (part I and part II), it’s time to publish the last statistics post for 2018, related to December, a month that has seen a slight decrease in the level of activity (oh the Christmas atmosphere). I have collected 106 events, 20 less than November. 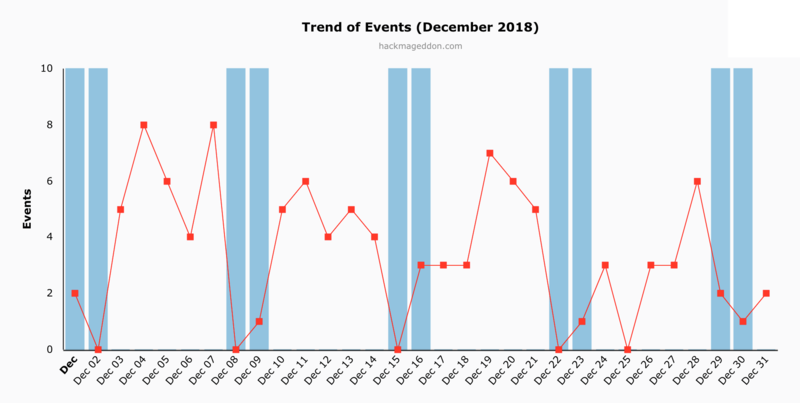 According to the Daily Trend of Events chart, December has seen virtually no activities during the weekends (and yes, the Christmas Day as well!). As always, Cyber Crime ranks on top of the Motivations Behind Attacks chart, but it has fallen below 80% (79.2% vs 82.5% in November). The three points have gone to Cyber Espionage (thanks China! ), at 16% vs 12.7% in November. The operations in Italy were not enough, so Hacktivism slides to 2.8% from 3.2%, whereas Cyber Warfare rises to 1.9% from 1.6% in November. Obviously malware is stable on top of the Attack Vectors chart, but its percentage drops to 25,5% from 31%, and most of all, it’s very close to that of account hijackings (24.5% from 19.8% in November). Targeted attacks rank at number three (like November) back at 14.2% from 12.7% (it was 14.2% in October). For the second month in a row, unknown attack vectors rank at number four. Governments rank on top of the Distribution of Targets chart with 17.9%, ahead of multiple targets (15.1%) and single individuals (13.2%). Most importantly… Stay tuned as I will soon publish the summary with the statistics for the whole 2018.